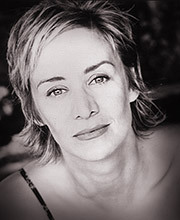 Janet McTeer is one of Britain’s leading actresses. She has made her principal impact in theatre, playing many classical roles (including Rosalind in As You Like It in the UK, Nora in Ibsen’s A Doll’s House on Broadway and Chekhov); her performance of the title role in Schiller’s Mary Stuart was especially memorable. She grew up in York and has a distinct ear for accents which made her an ideal reader for Wuthering Heights. Her film credits include Tumbleweed where she played a Southerner from North Carolina.